Root canal is an operation that tries to save a tooth whose roots have become infected. If the tooth is so far gone that it can’t be saved, root canal makes it possible for our root canal dentist Holladay to give the patient a dental implant. Whatever the outcome is, root canal removes infection that leads to sometimes extreme pain and abscesses, which are areas of pus that collect in the patient’s jaw. Though some people are dismayed when they’re told they need root canal therapy, modern techniques have made the operation both safe and at least somewhat comfortable. Sharp pain when the tooth bites down on anything, including food. Pain when the tooth is exposed to heat or cold that lingers even after the offending item is removed. Gums around the tooth that are red, swollen and tender. A pimple-like lesion near the tooth. During a consultation with our root canal dentist Holladay, the dentist orders an X-ray of the tooth, takes the patient’s medical history and explains the procedure, including the risks and benefits. They’ll explain what the patient should do before, during and after the treatment to make sure they have a good outcome. Some of our patients are so squeamish about root canal therapy that they need sedation dentistry. The dentist gives these patients a sedative like Valium to take the night before the operation. When they come in the next morning, they’re relaxed. Then, the dentist gives them other forms of anesthesia such as lidocaine or laughing gas. The patient feels no pain but is still awake. This is important, for the patient will need to follow the dentist’s instructions during the treatment. Young children who need root canal therapy may be given general anesthesia, which puts them to sleep. 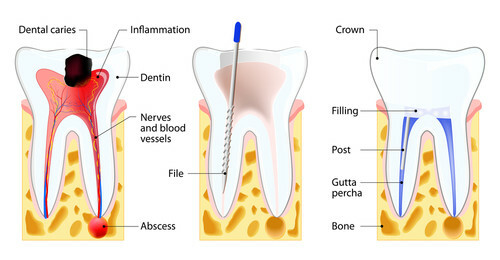 During the operation, the infection is cleaned out of the pulp chamber in the root of the tooth. The dentist makes sure these chambers are perfectly clean, disinfects them then fills them with gutta percha. This is followed by dental cement and a temporary filling. If the tooth was unable to be saved, the dentist gives the patient an implant. A post is inserted into the jaw to hold the prosthetic tooth, which can be made of metal, porcelain, a metal-porcelain mix or resin. Sometimes, the crown is placed right away on the post, and sometimes the post is covered up and allowed to fuse into the bone of the patient’s jaw. The tooth is invariably sensitive after the procedure, but our dentists prescribe pain killers and antibiotics to keep the patient comfortable and to guard against infection. The patient should not eat anything until the numbness in their jaw wears off. They can’t feel their tongue or cheek and may bite them by accident. They should brush and floss their teeth as usual, keep appointments with the dentist after the treatment and alert the dentist if they think something is not right. Most root canals Utah have a very good outcome.